Although the American educationalist and art-theorist Arthur Pope (1880-1974) constructed his colour-solid in 1924, another twenty-five years were to pass before it was finally published. His system is centred on a grey axis, divided into 9 gradations running between white (W) and black (B) (as shown to the right). 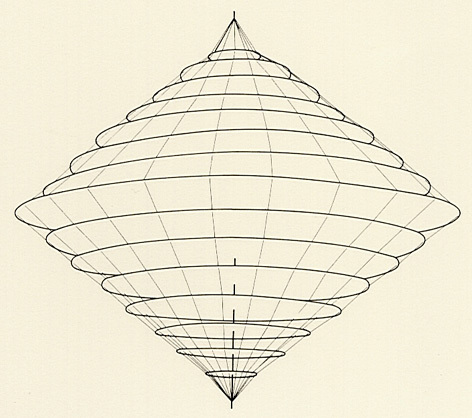 The solid itself can be envisaged as a series of triangles which vary in both size and shape. 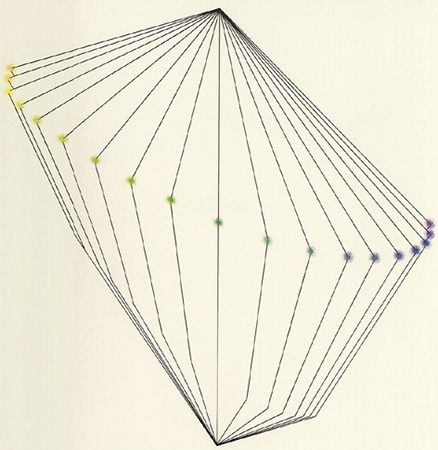 The two-dimensional projection of the three-dimensional arrangement results in a circle which is divided into twelve segments, one for each of the main colours: yellow (Y), green-yellow (GY), green (G), green-blue (GB), blue (B), blue-purple (BP), purple (P), red (R), orange-red (OR), orange (O) and yellow-orange (YO). 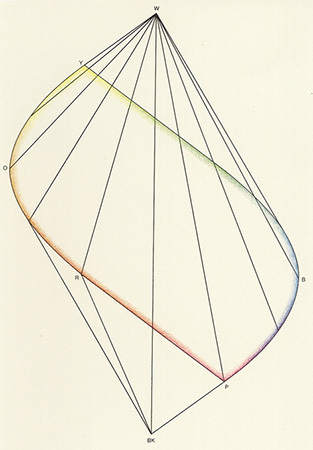 Hue, saturation (which he calls «purity») and brightness are chosen by Pope as the main features of colour perception. 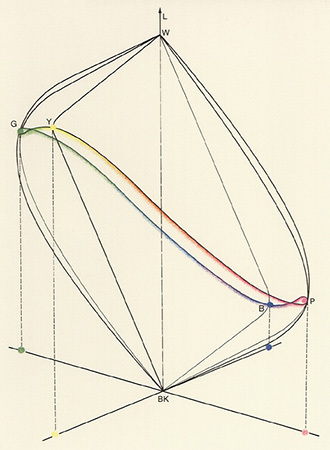 Tryggve Johansson’s colour system selects a similar layout to show the colour qualities which apply for any given colour hue, and Sven Hesselgren attempts to synthesise other similar experiments, all of which have Hering’s psychological approach as their origin and pave the way for the NCS system. 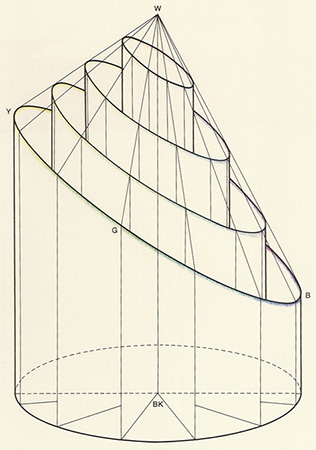 From a geometrical point if view, Pope’s system falls somewhere between Ostwald’s graphic double-cone and the calculated solid from Luther and Nyberg. This may be an appropriate point to review the experimental evidence for Hering’s four-colour theory, just as we have done with the Young-Helmholtz trichromatic theory. We have already mentioned that molecular and biological proof was provided in the 1960s for physiology’s ideas about the eye having three receptors corresponding to three basic colours. 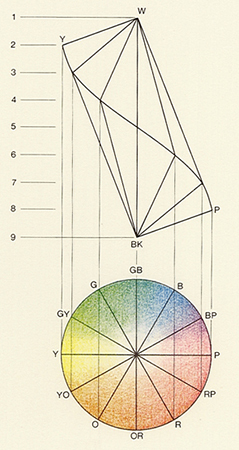 The first step towards the perception of colour on the retina is actually just as Young and Helmholtz envisaged. The second step, however, is somewhat more sophisticated: what the light-sensitive retinal cones actually register is not transmitted to the brain directly, as if each retinal cone would serve one nerve-cell which in turn continues to the brain; rather, numerous retinal cells — not only cones are involved here, but that is of no consequence — are interconnected before their combined information is passed to a nerve fibre. Discoveries made in the 1960s and ’70s show us that the processing of this visual information is organised in such a way that one nerve-cell (a ganglion) will transmit a signal when a specific area in the eye is excited by a specific stimulus. This area, which we can imagine as a tiny circle, is called the receptive field of the ganglion, and the stimulus exists when light is present at its centre but not at its edge, or the reverse. In this respect, the physiologists talk of an «on-centre» and an «off-centre». An «on-centre» nerve-cell will trigger its strongest signal when its receptive field is centrally illuminated and its periphery remains dark. An «off-centre», on the other hand, will become active when the periphery of its receptive field receives light, and the centre none. Up until this point, we have not mentioned colour. But on the strength of this fundamental insight into the processing of visual information we could well ask if corresponding receptive fields for colour exist. The answer is yes. They take the form of a mechanism originally postulated by Hering in 1878 when he talked of the opponent-cells of colour perception. As demonstrated by neuro-physiologists during the 1960s and ’70s, there are also «red-green» ganglions to be found in the brain which will become excited when red appears at the centre of their associated receptive field, and green at the edge. Red at the periphery will restrain such a nerve-cell in the same way as green at the centre; green at the periphery, on the other hand, will stimulate a nerve signal. Although with these opponent-cells we have reached a second step in the visual processing of colour, nobody can rightly say how many further steps on the way into consciousness are still to be discovered and understood. At the present time, we can only say that somewhere «further on», the opponent-cells connect with neurons in the cerebral cortex and function as a type of double opponent-cell: in other words, a few will become active, for example if the receptive field at their centre receives red but not yellow, and their periphery receives yellow but not red. Further investigation into the higher levels of colour processing will no doubt follow these initial physiological inquiries. Colour vision involves many phenomena which remain unexplained on a molecular and cellular level, with simultaneous contrast being just one example. But the greatest step still to be made is an explanation of how the brain manages to maintain a constant impression of the colour — for example of a leaf — in ever changing conditions of ambient light, or why white paper still appears so in the light of the midday sun, at sunset, and by the light of a table lamp. Of course, when seen from an evolutionary viewpoint, colours can only make sense in the presence of such constancy and stability, which to this day continues to be as wonderful as it is mysterious. Date: American colour-theorist Arthur Pope put forward his colour-solid for practical use in 1929. Related systems: Sowerby — Hayter — Helmholtz — Ostwald — Boring — Luther & Nyberg — Johansson — Hesselgren — N.C.S. 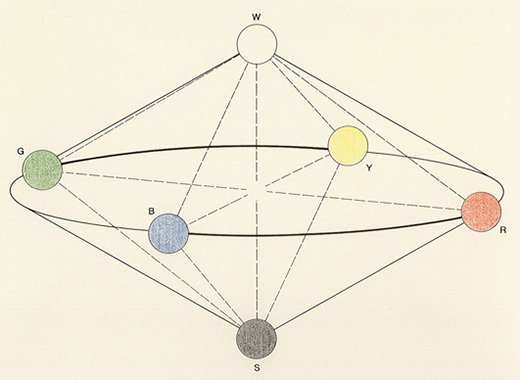 Bibliography: A. Pope, «Tone relations in painting», Cambridge 1922; A. Pope, «An introduction to the language of drawing and painting», Cambridge 1929; A. Pope, «The Painter’s Terms», Cambridge 1929.